WestConnex will chop 12 meters from the south side of the park – the width of two or three houses. This will wipe out most of the big old trees on that side of the park. Euston Rd will be carrying 70,000 vehicles. Campbell Rd will be carrying 60,000 vehicles. There will be two smoke stacks (which are called Ventilation Facilities in the plans, but don’t be fooled. They’re concentrated, unfiltered car exhaust). One will be right on the edge of the park – the other will be about 100 meters away. And on the south side of Campbell there will be a four story spaghetti flyover. The flyover will be visible from half the park, and the noise and pollution from it and the smoke stacks and the extra traffic on Campbell and Euston will make Sydney Park a much less healthy place to be. Objections close at 5pm this Friday, the 29th. Just wondering where you get the 60,000 and 70,000 numbers from. Are there cars waiting some where for the west connex to be built and then decide to come over and use the road? Sydney Park is surrounded by three or four very busy roads now. In the afternoons Sydney Park Rd and Campbell Streets are blocked with traffic wont this new road make traffic flow better? You mention about some of the park being lost but how much extra park land will be created south of Campbell Street? According the to the EIS, it’s not that cars are waiting for this bit of WestConnex to be built. Rather, once the WestConnex is built, they’ll start using the New M5 (and paying tolls) instead of using the M5 East that they are currently using (for free). 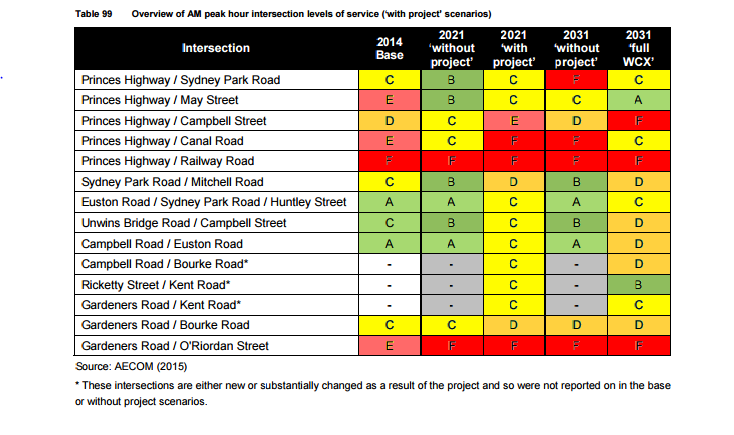 And, according the to the EIS, the new roads are going to make traffic worse, not better. In technical terms, the project is going to lower the ‘LOS’ (Level of Service). A is good. F is ‘over capacity’. As you’ll see, almost every intersection is better off without the New M5 (‘without project’) than with the New M5 (‘with project’). And as bad as the predictions are, they’re optimistic. Even the EIS admits that the forecasts are ‘likely to be optimistic’. These roads crawl. Euston struggles to carry 7,600 cars a day. Expanding it from one or two lanes out to two or three lanes is not going to allow it to carry 60,000 or 70,000 cars. That’s 50% more traffic than Victoria Road can carry. But even if you added 10 lanes, you won’t get 10 times as much traffic down the road. You might not get any more than the 7,600 cars you get now. As soon as you reach the end of the widening, these roads go back to the same number of lanes as they have now. Even if you widen them all the way to the ocean, the roads that they feed are also bottle necked. Technically, Euston Rd should carry more cars than it does. The reason it doesn’t is that there isn’t anywhere for them to go. WestConnex won’t change that. It will probably make it worse. For much the same reason, widening the M4 and M5 probably isn’t going to improve traffic by much, if any. Yes, the tollroads will hold more vehicles, but if you can’t get any more cars off the tollroads than before, you actually travel slower because there are more cars than before. The only reason to believe that the M4 and M5 might improve (and this is what the EIS says will happen) is because people won’t be able to afford to use them – they will use free roads instead. The tolls will be up to about $8 each way, and will rise by 4% a year. Triple that for trucks. And it applies to whole M4 and M5, not just the bits that are currently tolled. The EIS actually predicts that less people will use the M4 and M5 than they do now. If that happens, then the M4 and M5 will become faster, for those that can afford to use them, while roads like Parramatta Rd and Stoney Creek Rd will become slower. 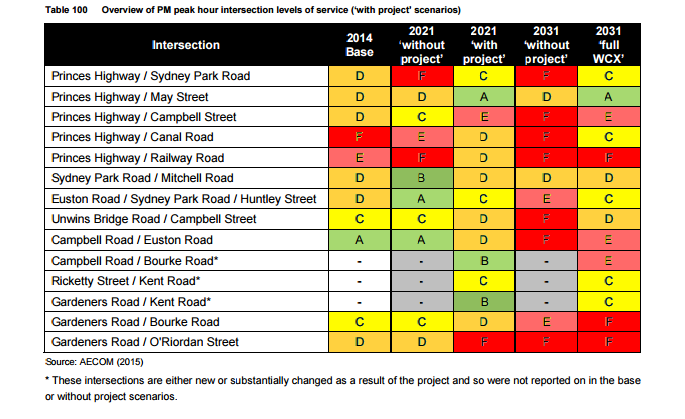 Just to make sure of that, WestConnex are proposing that there should be extra bus lanes on Parramatta Rd, and on the Princess Highway as well. This is how they can predict that public transport times will improve – because they are converting ordinary lanes into bus lanes. And this is how they predict that congestion will get better on the M4 and the M5 – because they will be forcing anyone who can’t afford the tolls to find another road. So in short, the proposal is to spend $18B to create a road system that is intended to carry less people than before, for a price, where they used to be able to travel free, or for a lower price. I’ll have to check how much land is being added – but given that it’s going to be metres away from a 4 level spaghetti flyover carrying 100,000+ cars a day, it’s not going to be a pleasant place to be. minutes in the afternoon peak in comparison with a future scenario with no project. The before figures are in the Updated Strategic Business Case, Tech Paper 1, Table 4-1. The 7,610 figure for Euston Rd is on page 31, which is the 32nd page in the pdf. Available at http://www.westconnex.com.au/library/key_documents_and_maps.html. Based on information elsewhere, we believe ‘2031 Build’ includes the M4-M5 link and the Airport Gateway. i.e. not the actual project for which they’re seeking planning approval. We asked why, and they said they can’t model ‘2031 New M5’, so they’ve modelled this instead. I’m not quite sure what they’re defining as “St Peter’s local area”. I don’t know what those numbers are. The obvious candidates are current traffic, traffic with no build, traffic with build. But none of them quite seem to match. Maybe I’m missing something. According to the business case, Campbell West of Euston currently carries 11,500, and this will grow to 13,400 with no build. With WestConnex, in 2021, Campbell Road West of Euston Road alone carries 30951+36776=67,727 vehicles a day, or is supposed to. The numbers are a bit different for 2031, but no smaller than for 2021. This wouldn’t be the first time we’ve found the EIS contradicts the EIS. If WestConnex goes ahead, it will decimate Sydney Park. Great summation Ben. I assume the $18B is the projected cost at the commencement up from the $16.8? We know there will be cost blowouts that will likely exceed any contingencies that are in the redacted business case, so your figure is conservative. To those that are struggling to find numbers that add up, the EIS appears to be designed to make that exceedingly difficult, There is much duplication across chapters, modelling in the appendix of a technical paper that is itself an appendix. If you are just starting your submission now, and don’t want to enter the maze, then trust those that have done the work. Because some of the spending will be in the future, the value in 2015 dollars is less than the total amount spent. This has been blowing out at $2B a year. It’s always been the next stage that will fix the problems the current stage will create. And it always will be. Using roads to move large numbers of commuters has never worked and it never will. The project is going ahead. There’s nothing you can do to change it. It’s terrible what’s happening to Sydney park; however that location was probably chosen to reduce the number of residential and business resumptions. I think this is one of the downsides of living in the city… Infrastructure will enevitably need to be upgraded and people will be impacted. This tollroad will be stopped, the question is where. They don’t have planning approval. They don’t have funding. The road is not viable. It will cost more than the Cross City Tunnel to build, and on their own numbers, it will carry less traffic. This is infrastructure, but it’s the wrong infrastructure, in the wrong place. And it’s horribly expensive, both for residents, taxpayers, and users. It’s going to cost $18B to build (and that cost is going up by $2B a year). The cost of tolls will mean that less people will use the M4 and M5 than currently use it. They’ll save a few minutes, but they’ll pay $10 each way to do so. Or maybe they’ll just pay and not save any time at all. And the EIS even says that because the tolls will push people off the M4 and M5 onto other roads, it make congestion worse on other roads in Sydney. WestConnex is an expensive way to make Sydney’s traffic worse. There are no winners.